Artist and art educator Andrew Nordin recently went on a road trip to Montevideo, Minn., with both his father and his son to check out Karl Unnasch's public art piece "The Rustician." 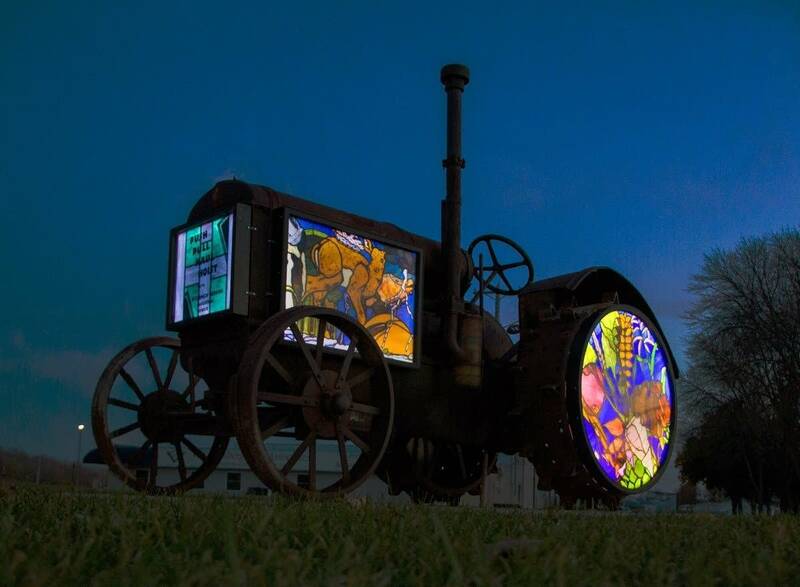 Installed in downtown Montevideo last fall, the sculpture consists of a 1920s-era McCormick Deering tractor covered in illuminated stained glass. Nordin says "The Rustician" pays tribute to the land and industry that are intrinsic to the Midwestern town. Artist, teacher and critic Regan Golden took her students to see an exhibition of George Morrison's small drawings and paintings at the Minneapolis Institute of Art, and while it's tucked away in a small gallery, she believes it to be one of the most important art shows she's seen this year. Morrison, an Anishinaabe modernist who died in 2000, created abstract works that were heavily influenced by his upbringing in northern Minnesota. Golden says his bold use of line and color is only just now being fully appreciated by the contemporary art world. On display through July 1. The Singers artistic director Matthew Culloton recommends that music lovers young and old check out the Copper Street Brass Quintet at the Capri Theater in north Minneapolis this weekend. The theme of this concert is "Brass in Space," and will include classical works (think Gustav Holst's "The Planets") alongside more popular fare (think "Star Trek" and "Alien"). Culloton says the players' personalities and sense of humor come through in their work, and the show is sure to be lots of fun. Performances are at 7:30 p.m. May 4 and 5.